This idea was offered by Bram. United Therapeutics is set to acquire SteadyMed for $4.52 + $2.63 in CVR upon the achievement of a milestone tied to the launch of a new therapy called Trevyent. Timeline for CVR payout is up to 5 years. Merger is subject to STDY shareholder approval and 43.3% of shareholders entered into agreement to vote in favor of transaction. Shareholder meeting is set for 30th of July. This is an attractive risk/reward to several risk mitigating qualitative factors. This potential payment - or CVR - is an all-or-nothing milestone that must be met within five years of the deal closing. In effect, by buying in at $4.52 you are paying $0.07 for a chance to receive either $0 or $2.63 - either a loss of 100% or a gain of 2822% from the date of closing. Up until the date of closing there is effectively only the risk to lose a substantial amount. If the deal falls through entirely this investment can potentially result in a disastrous loss. SteadyMed is a very small cash burning pharmaceutical company. It would likely require some other form of (dilutive) funding to continue as a going concern. The good news is that due to a few quantitative (43% of shareholders support merger) and especially important qualitative factors I view the probability of the deal falling through as extremely low. For detailed discussion on probability of CVR payout see the last section of the write-up. Her daughter is now still alive and doing quite well thanks to this drug. She is actually working at United Therapeutics to source cures for orphan drugs - pharmaceutical which remain commercially undeveloped. Martine tells this remarkable story on stage here. It seems likely the market is unaware of this backstory. Potentially Steadymed's Trevyent is a superior therapy to United Therapeutics Remodulin. 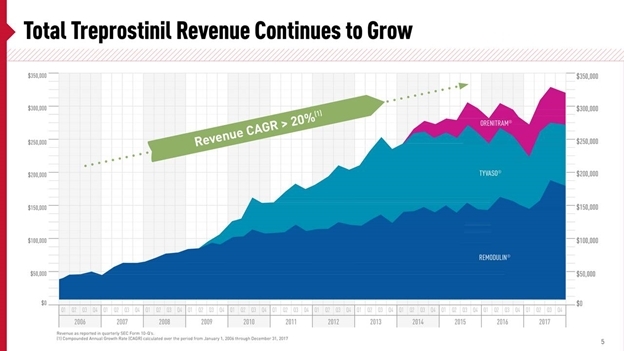 Remodulin is a significant part of United Therapeutics revenue. Steadymed's Trevyent is "nothing more" than a potentially superior pumping system to deliver the same drug as Remodulin delivers: Treprostinil. However, there are indications, like Trevyent being granted an orphan drug designation, to believe it could deliver a significantly better and safer patient experience. Advantages could include a less painful experience for patients and lower probabilities of infections. A simple practical benefit is that it could make it much easier on patients to take showers. A cynic might argue United Therapeutics is buying its competitor up to kill its product before it hits the market and destroys its own cash cow. However, if you know the backstory of Martine Rothblath, you'd know that she made heaven and earth move to save her daughter. That daughter, who is afflicted with PAH herself, works at United Therapeutics and dedicates herself to sourcing other undiscovered orphan drugs that just seem like a highly unlikely scenario to me. Steadymed has a current market cap of just north of $119 million. United Therapeutics has a market cap in excess of $4.5 billion. United Therapeutics has $932 million of cash and equivalents on its balance sheet and $250 million in long-term debt. United Therapeutics has a TTM EBITDA of $856 million. To me, it appears the probability of this deal completing successfully should be at the high end of the range for deal closures. In the unlikely event that doesn't happen, I think it's fair to prepare for a stunning loss. It could be anywhere between 50% and 100% of the amount invested. If you get out ASAP on a dealbreaker, it's probably closer to the 50%. Why I like this transaction? The opportunity is so attractive because the majority of a potential investment is locked up only a short time, likely until the end of the third quarter. That's about 90 days from now. After that ~90-day period you will receive 98% of your investment back on a close. After five years the remaining 2% is either a write-off or it will have generated a staggering return of 2800%+ for you. To make this a bad bet, the probability of a payout has to be very low. Receipt of the first approval by the FDA of a "New Drug Application"
The CVR Consideration will be payable if, within five years of the Effective Time, and following receipt of the first approval by the FDA of a 'New Drug Application' (as defined in the CVR Agreement) for the Trevyent® product combining the Company's PatchPump® delivery device with treprostinil for treatment of pulmonary arterial hypertension (the 'Product'), a total of 3,000 'Initial Treatment Visits' (as defined in the following paragraph) have occurred in the United States (the 'Milestone'). Without condition 1 being met. Condition 2 can’t be met. Approval by the FDA looks like a formality because the system administers the same drug and it already has the orphan drug designation. If it comes through soon, five years should give the company a very good chance of hitting 3k initial treatment visits. The Trevyent NDA is on track for resubmission to the FDA before end of 2018. FDA has requested further information on certain device specifications and performance testing and has requested additional design verification and validation testing on the final, to-be-marketed Trevyent product. 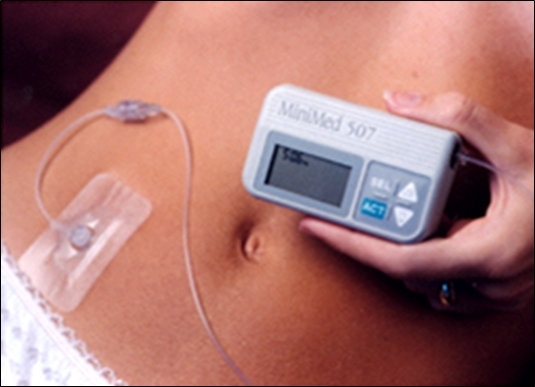 The FDA is not requiring SteadyMed to conduct any clinical trials to prove the safety or efficacy of Trevyent and has agreed that a repeat of in vitro Design Verification (DV) testing on the final to-be-marketed Trevyent product, supported by pharmacokinetic modelling and Process Validation, should be adequate for the resubmission and acceptance of the 505(b)(2) New Drug Application (NDA). United Therapeutics seems like a highly motivated owner to make this work. United Therapeutics already has 3,000 patients on a similar system and should be able to easily market a version to them that improves their experience. The number of patients in the United States is certainly in the hundreds of thousands, with many more who are undiagnosed. About 200,000 hospitalizations occur annually in the United States with pulmonary hypertension as a primary or secondary diagnosis (1). About 15,000 deaths per year are ascribed to pulmonary hypertension, although this is certainly a low estimate (1). Most medical references to heart failure are for left heart failure, which in the United States has a prevalence of about 4.9 million and an annual incidence of 378 per 100,000 (2,3). Pulmonary hypertension, which causes right heart failure, affects all races and socioeconomic levels. From what I understand, only very ill patients will undergo Remodulin therapy as it is rather invasive. However, with as much as 15k patients dying every year it seems even the group of very seriously ill patients should be much larger than the number that's currently on Remodulin. Growth rate happened fast with Remodulin. When United Therapeutics rolled out the predecessor Remodulin it got picked up fast. In 2002 it got approved at $90k per year per patient. Within one year annual sales jumped to $50 million (~500 patients) and by 2010 sales rose to $300 million or (3000 patients). From a United Therapeutics graph growth leveled off after that which indicates the population was saturated within eight years. There is a risk the acquiring party could game the CVR in an attempt not to pay. However, it has contractually agreed to make an effort opening it up to litigation. In addition soft indicators described above make it further unlikely. As the greatest risk I identify the company through honest dealings simply not being able to reach the 3000 initial visit limit. Due to the size of the potential patient population I don’t believe that risk is sufficient to keep me from investing a tiny amount into a potential very large payoff. Bram, do you know what % votes they need for the merger to go through? I see from the PR that ~43.3% of shareholders agreed to vote YES on the merger. About 63%+ of people have a special interest. We need a majority of the votes that are cast by people without special interests to be FOR. In addition if 2% of people with a special interest vote against that can block it. The special voting requirement is actually: the total number of Company shares held by shareholders who do not have a Personal Interest who vote against the Merger Proposal cannot exceed two percent of the aggregate voting rights in the Company. I’m thinking I will wait to buy in after the vote, if I can and it makes sense. for everyone’s benefit, pasted below. (b) is a little worrying as it seems like a very small # of NO votes from “shareholders without Personal Interests” can sink the merger. Why would they set that threshold so low? Is there any reason to think they won’t get the vote? I thought it was a little bit of an unusual treshold but I read it as being negotiated by a smart insider party that wanted to have a secure flexible “out” in case they happen to identify a better way forward. I believe this is because the company is organized under Israeli law, the quote above implies that as well. 2. of the 2 conditions I posted above, only one has to be met for the merger to pass. Either they get a majority of the persons without Personal Interests to vote FOR; or failing that, the AGAINST votes by persons without Personal Interests comes in at 2%. That being said, I guess chances of merger passing are still decent. 1. There are two issues being voted on. I think the votes do count for the other (less important) issue. Shareholders approved the merger. Transaction expected to close over the next two months. SILVER SPRING, Md., Aug. 30, 2018 /PRNewswire/ — United Therapeutics Corporation (NASDAQ: UTHR) (“United Therapeutics”) today announced that it has closed the merger of SteadyMed Ltd. (NASDAQ: STDY) (“SteadyMed”) with a subsidiary of United Therapeutics. Pursuant to the merger, United Therapeutics acquired all of the outstanding ordinary shares of SteadyMed. As a result of the merger, SteadyMed ordinary shares are no longer publicly traded on the NASDAQ Stock Market. Now we just have to wait until ~2023 lol. Does anyone with a medical background want to weigh in on the odds? Also, where can we track the milestones? UTHR earnings? Does anyone know how onerous or easy it is to file for Israeli tax exemption? Rick, I’ve done it a couple of times, the last one being Backweb, which I’m still waiting for the last liquidating dividend. I had to fill out a number of forms, so it wasn’t all that pleasant but it wasn’t all that onerous either. I’m in this one too in size, so we’ll see how it goes. Ah, Backweb. Nice to see someone else in that one – and someone else still waiting….hopefully we are nearing the end. I just received the form. Could anybody tell me what is “Registered Holder”? Is it the broker’s name? I bought STDY in my IB and Merrill Edge account. I have the same question, sounds like we have to submit a paper form but dont know what to fill in for the “registered holder” and how to receive the money (through wire to IB?). Anyone has clue? I have an outstanding support ticket with IB to confirm (support had to check it with their back office), but I think you only need to fill in the Israeli tax declaration on the letter of transmittal (and a form W8/W9) since IB is holding the shares in street name. So you really can’t fill that in. The agent has indicated that pages 2, 6 and 14-17 are required to be completed and that no W8/W9 is needed. Note for page 2: Please fill out the top section with the customer name/address, and the number of shares. The direct registration route through which a shareholder can become a registered holder is one of three ways in which a security can be held. The other two ways of holding a security are in street name or through physical certificates. An investor’s preference for using one of these three ways of holding securities would be based on factors such as convenience when trading, cost, risk, preferred method of receiving dividends and communications, etc. A registered holder is distinct from a beneficial owner or holder, whose holdings are held in a brokerage account or by a bank or nominee in street name. But as shareholders of a company, registered holders and beneficial owners have the same rights with regard to voting, receiving dividends and communications, etc., the only difference being the manner in which voting rights are exercised and dividends or communications received. I’m seeing in my Schwab account that the tender offer shows expiration now of 5/27/19?? does anyone have an update regarding forms needing to be filled out, when we can expect the cash portion to hit our accounts? Rick, see discussion above regarding the forms. And cash portion hit my IB account last week. Has anyone reviewed the tax treatment of the Steadymed CVR? Mine is showing up in IB as if the full consideration of $2.63/share was paid in 2018 but I thought per the merger proxy that the fair value would create the basis. Given this, would the taxable amount in 2018 be the difference between the final share price and the cash consideration of $4.46? In my account the STDY CVR was also valued at $2.63 / CVR. However, when I opened a ticket and explained the situation they marked my position down to $0.26 / CVR (net last traded price). Long boring story. Just saying: the IB tax / valuation treatment of non-listed instruments is not always correct. In this case they adjusted the valuation after opening a ticket and it is my experience that they will usually do this if their approach makes no sense. My CVR on Etrade shows up as $0.00. It shows up as a small taxable loss in 2019, no payment for CVR.